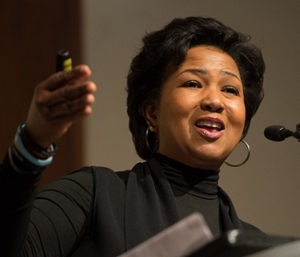 NASA Astronaut Dr. Mae C. Jemison spoke to an audience of more than 900 people Thursday night, March 16 at the Southern Illinois University Edwardsville Morris University Center’s Meridian Ballroom. Jemison talked about “Exploring the Frontiers of Science and Human Potential.” SIUE’s Arts & Issues and the SIUE Departments of Chemistry and Physics presented her visit. Sponsors of the show were the following SIUE schools and departments: Graduate School, College of Arts and Sciences, Office of the Provost, Student Government, Chemistry Club, SIUE Alumni Association, Dr. William J. Probst Memorial Lecture Fund, Dr. William C. Shaw Lecture Fund and Millipore Sigma. The event was funded in part by student activity fees. Jemison was the first woman of color to travel in space. Jemison, an engineer and physician, travels across the country and speaks about such issues as health care, social responsibility, technology and motivation. The Arts & Issues series brings artistic excellence to the SIUE campus through an eclectic blend of speakers and performers. For more than 33 years, SIUE’s Arts & Issues series has showcased some of the world’s finest artists. Each season, thought-provoking speakers inspire people of all ages and backgrounds. Thanks to the underwriting of SIUE, corporations, foundations and individual donors, tickets are often discounted as much as 50 percent. Arts & Issues is tied to the academic mission of the University and offers unique opportunities for students, faculty, staff and the community, to engage with performers and speakers through master classes and special sessions.